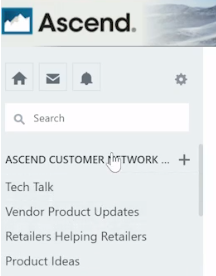 The Ascend Customer Network (ACN) is a discussion-oriented forum that connects retailers with the Ascend team and other Ascend retailers. How can I get on the ACN? Just click this link! Or go to AscendRMS.com > Help and select Ascend Customer Network. Then enter your email address and select Sign up to send a request to join. Once your request is approved, you’ll get a confirmation email. How do you use the ACN? Discuss any concerns, share solutions, and post relevant images, links, and videos. Find users with the same interests as you and join those groups, or if none of the existing groups fit your needs, you can create a new group! 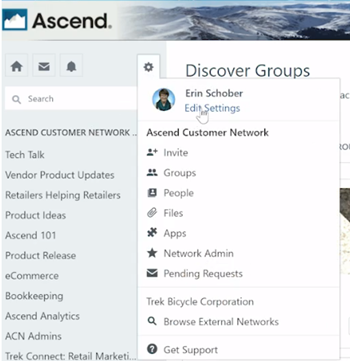 Just select ASCEND CUSTOMER NETWORK over on the left to browse the groups and join any existing groups. Or select the Create a New Group button on the right to create a new group. You can add a profile picture along with contact and location information to share with other users and help you connect. Select the Settings icon (gear icon near your notifications) > Edit Settings. Update your settings to enable or limit alerts by going to Settings > Edit Settings > Notifications while signed in and selecting the ACN.